A meeting with the Chinese Ministry of Health “reinforced the Chinese Government’s commitment to both reform in China as well as an interest in improving organ donation and transplantation activity and outcome in neighboring countries.” TTS delegates offered praise and support in helping China further, what has been for the international transplant community, long-awaited changes. 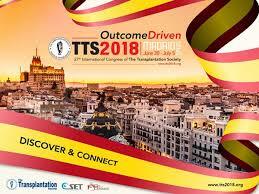 We are troubled as well that TTS has invited both Haibo Wang, director of the China Organ Transplant Response System Research Center at the Ministry of Health and Zheng Shusen, chief of Hepatobiliary and Pancreatic Surgery at Zhejiang University International Hospital, Zhejiang University, to speak at the 2018 TTS conference. Haibo, strongly defended China’s transplantation practices at the Vatican summit last February but was not willing at that time to deny the use of organs from executed prisoners. Back in 2014, Haibo justified the use of prisoner organs due to the massive shortage of voluntary organ donations. Zheng’s history as a transplant surgeon is disturbing. He once claimed to have carried out 46 “emergency” liver transplants (i.e., performed within one or two days) between January 2000 and December 2004, years before the Chinese regime started accepting organs from volunteer donors. At the 2016 TTS Congress in Hong Kong, former TTS president Dr. Jeremy Chapman complained that a research presentation, generally understood to be Zheng’s, violated internationally accepted ethical standards. Chapman demanded an investigation and promised that if his suspicions proved true, “Then they will be named and shamed, and they will be excluded from our meetings forever – and from publication in transplantation journals.” Just a few months later, a study co-authored by Zheng published in the October 2016 edition of the journal Liver International was retracted after he failed to provide any evidence showing that he had not obtained organs from executed prisoners. European transplant professionals are also working with China despite any indication that China has improved its ethical standards. An article from Xinhuanet in October boasted of China’s ongoing relationship with Europe to better train transplant physicians in ethical organ donation and transplantation. The report notes that seven Chinese universities will offer postgraduate courses under the KeTLOD project (Knowledge Transfer and Leadership in Organ Donation from Europe to China). Co-founded by the European Commission and Chinese universities. The two-year program is expected to enroll 140 postgraduate students. The international community’s affirmation of China’s progress belies the absence of publicized methodology to rule out organ sourcing from prisoners of conscience, particularly Falun Gong practitioners. Furthermore, there has been no independent investigative panel to determine to what extent Falun Gong practitioners have been, or continue to be, victims of forced organ harvesting. Additionally, the reported number of freely donated organs in China, hardly enough to account for China’s transplant numbers, cannot be verified without independent analysis. The persecution of Falun Gong practitioners is ongoing in China. Falun Gong, a meditation and self-improvement practice, has been persecuted by the communist regime due to adherents’ belief in truthfulness, compassion and tolerance. The ostracization of this group, fueled by a massive campaign of propaganda and deceit, has facilitated the growth of the government’s forced organ harvesting program, making China a world leader in transplantation medicine. Medicine is based on science. We use data rather than verbal assurances to determine truth, particularly assurances from a government known to engage in egregious human rights violations. The international transplant community must be responsible for upholding the integrity of our profession. Without accountability, our standards of care are compromised by bias and faulty judgment. Isn’t good medicine in fact informed by the very standards followed by Falun Gong practitioners? When we no longer have the forbearance to value truth and compassion over profit and convenience, how can we be entitled to the privilege of practicing medicine and serving our patients and communities?